As clinical as it sounds to express the value of human lives, health, or the environment in cold dollars and cents, cost-benefit analysis requires it. More disturbingly, this approach is being embraced by a growing number of politicians and conservative pundits as the most reasonable way to make many policy decisions regarding public health and the environment. 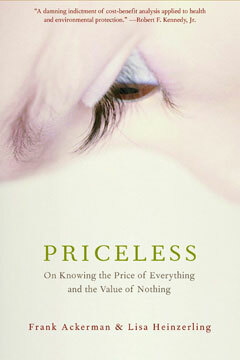 By systematically refuting the economic algorithms and illogical assumptions that cost-benefit analysts flaunt as fact, Priceless tells a “gripping story about how solid science has been shoved to the backburner by bean counters with ideological blinders” (In These Times). Ackerman and Heinzerling argue that decisions about health and safety should be made “to reflect not economists’ numbers, but democratic values, chosen on moral grounds. This is a vividly written book, punctuated by striking analogies, a good deal of outrage, and a nice dose of humor” (Cass Sunstein, The New Republic). Essential reading for anyone concerned with the future of human health and environmental protection, Priceless “shines a bright light on obstacles that stand in the way of good government decisions” (Public Citizen News). Lisa Heinzerling is a professor at the Georgetown University Law Center, specializing in environmental law. She lives in Bethesda, Maryland.